POCS is our comprehensive dashboard that provides key clinical information including labs, visit notes, nutritional needs, allergies, medications, diet orders, anthropometry and more. Easily lookup historical values and identify trends. Manage your patient records and calendars in one place. Because scheduling and documentation live within one system, you never have to toggle between programs. Build, edit, and view regular and custom schedules. Make your notes based on the ADA's International Dietetics and Nutrition Terminology (IDNT). Review and analyze all data pertinent to clinical decision making from the same screen while inserting your assessments, nutrition diagnosis or interventions. Pull in various nutritional calculators with just one click. Encounter view provides a quick summary of all charting activities performed during and after a visit. On follow up sessions easily scroll through previous encounters, or skip to any part, to see patient improvement. Nivigo is a cloud based nutrition-centric electronic-health record (EHR) system and practice management solution, developed expressly, for registered dietitians (RD) and nutritionists. Unlike other commercial nutrition and wellness tools nivigo is designed for use in a clinical setting to facilitate the Academy of Nutrition and Dietetics' Nutrition Care Process (NCP) and to help integrate nutrition standards and processes into information systems for dietetics practitioners providing Medical Nutritional Therapy (MNT) and Wellness. Practitioners can capture a variety of clinical information, such as biochemical data, anthropometric measurements, allergies, medications, food/nutrition-related history, nutrient goals, physical examinations, frequency and type of physical activity, screenings, referrals, physician contacts, past medical history, family history and prescribe supplements and formulations for enteral and parenteral nutrition. Nivigo offers screening tools to effectively identify nutritional risk in a pre-pathologic phase and several calculators that automate complex calculations needed for assessment, diagnosis and intervention including; BMI, body fat%, activity factor, TEE, body mass, respiratory quotient, healthy body weight, nutrient requirements etc. Although the service is geared towards dietetics practitioners, the practitioner’s clients will have access to the platform and to an innovative mobile application personalized to their unique health, nutrition and behavior needs. The mobile application helps clients maintain health, diet and exercise diaries and then share them with their provider creating an effective partnership between patient and practitioner. Practitioners can learn about their client's progress & challenges between office visits and provide real-time intervention; such as sending alerts to measure blood glucose, blood pressure, weight and other metrics or sending prompts to work-out or scheduling reminders to take their supplements etc. You can also create and store client education handouts, grocery lists, meal plans, activity plans and more. Nivigo is for registered dietitians working in various settings, including: hospitals, private practice, health clinics, extended-care facilities, physician offices, home-care companies, community and public health programs, colleges and universities, school food service, state and federal health and nutrition programs, research organizations, and food or pharmaceutical organizations. Medical nutrition therapy is provided by registered dietitians (RDs), who are the only health care professionals with nutrition-specific training. RDs have demonstrated efficacy in providing MNT and wellness as a means to prevent or delay disease or complications from diseases such as diabetes and produce significant improvements for many clinical outcomes. However, there are no quality tools relevant for dietetics practioners in an otherwise medical EHR. Existing solutions are fragmented and a practitioner has use multiple systems which contributes to suboptimal charting and discontinuous care. Nivigo is the only nutrition-centric electronic-health record (EHR) system and practice management solution, developed expressly, for registered dieticians (RD). Nivigo enables dietetics practitioners to document, track, measure and evaluate the effectiveness of their professional practice by enabling the practitioner to apply the the Academy of Nutrition and Dietetics' Nutrition Care Process (NCP) and to document patient data using the International Dietetics and Nutrition Terminology (IDNT) standardized language, paving the way for it to be used universally. 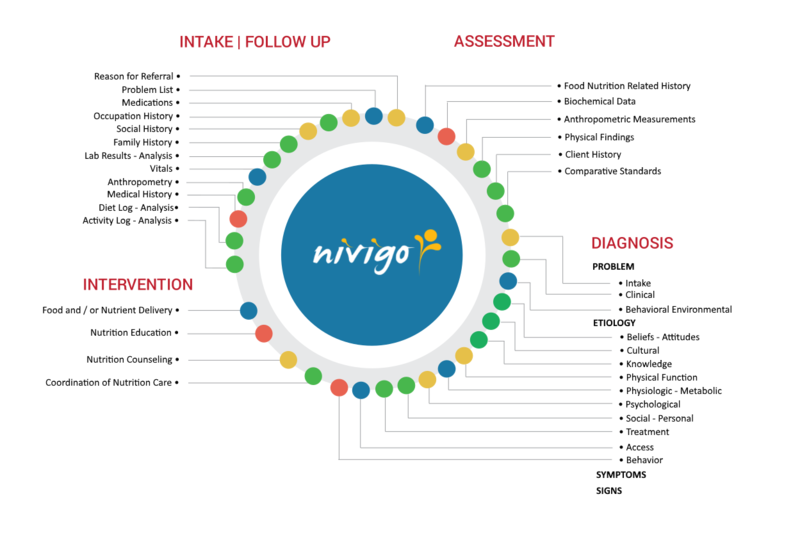 Nivigo allows practitioners to integrate and display nutritionally relevant clinical data from multiple sources while providing point of care information; including comparative historical trends on both structured and unstructured data. Nivigo offers additional features such as scheduling, notifications, reporting, invoicing and billing to help manage all aspects of a dietetics practice; an end-to-end solution. B. BMI above the 85th percentile for age in children. D. severe vitamin or mineral deficiencies. G. lipid storage disorders (e.g., Fabry’s disease, Gaucher’s disease and Neimann-Pick disease). * Nivigo Beta Program is a single user license to use our cloud based nutrition informatics software and member portal free for 60 days. Just sign up with your email and phone number and will send you an invite code to start using the solution. No credit card required. © 2017 HighbrowTech LLC. All Rights Reserved.